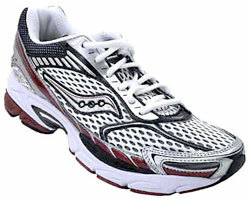 Go in to any shoe store and you will see the amazing selection of running shoes available to the consumer. With so many types of running shoes out there, it’s hard to know which one you may need. So to make it easier, I have split them into 3 main groups; Cushioning, Motion Control, and Stability. This article will concentrate on Cushioning Shoes. I will talk about their construction and also what kind of traits you may have that would indicate you may need a cushioning shoe. Cushion shoes are the most flexible of running shoes, compared to motion control and stability control ones. Cushioning shoes are built on a last that is curved inward. A runner with a normal to high arch and who’s foot rolls towards the outside (under pronation) would need this type of running shoe. So by having a inward curving last the runner is allowed a natural motion (natural pronation) that they would not normally have. A cushioning shoe will allow the runner to gain more cushioning with their gait (motion of walking) by creating a natural pronation as they run. Having a natural pronation absorbs shock that the legs would normally take. These shoes have nylon uppers and their soles are made entirely of phylon and/or blown EVA. Some may also have a plastic web underneath the arch of the shoe. There are many different levels of flexibility, and degrees of cushioning available to fit the runner’s needs. Having a knowledgeable sales person measure and properly fit you is always recommended. By choosing the right shoe you will have a smoother and more enjoyable run, and also have less chance for injuries. This entry was posted in Recreation and Sports on January 10, 2014 by admin_z.